Nose Graze — Young Adult book reviewsTransparent was so much fun! I thought this book sounded awesome, but then I got nervous when I read several 'meh' reviews of it. But luckily, I ended up really loving the book!In some ways, Transparent almost read like a contemporary book. It's not super heavy on the sci-fi stuff or the world building. A lot of it has to due with a girl running away from her abusive father and trying to fit in at school despite being a bit of an oddball. Fiona is invisible, but that's not as awesome as it seems. People can't see her, even if she wants them to. She has no idea what she looks like, people can't see her body language, they can't make eye contact with her since they can't see her eyes, etc. Fiona struggles with accepting this, and the book really made me understand how difficult life must be for her.I loved nearly all the characters in this book! There are a lot of them, but they all have such unique voices. Bea was an awesome best friend, Carlos was kind of annoying but he was almost so absurd that it was funny, and Seth is a great example of first impressions not always being correct. I like how all the characters played a significant role in the book and everything came together nicely in the end!"Whatever. I could strip down, break into your house, and kill you before you even woke up. "—Fiona, Transparent by Natalie WhippleThere is a bit of a romance in Transparent but it's pretty subtle, which is kind of nice. It's a great compliment to the whole "trying to fit in" part of the book. One of the problems with being invisible is figuring out how a relationship can even work. And Fiona's understandable trust issues just make it even more complicated! But the romance developed slowly and ended up being a good part of the book! I really enjoyed it!There were a few moments when I was really annoyed with Fiona though. When she found out that Seth liked her, she FREAKED OUT and went on about how he "manipulated her". Uhh, I thought that was pretty ridiculous. He wanted to spend more time with her but was afraid she wouldn't want to so he found ways for them to coincidentally be together so that he could get to know her better. I didn't see anything wrong with that! Also, on a slightly different note, I kind of didn't get how she figured out that Seth could see her. She nodded at him, and then figured it out because she was like, "OMG he can see my nod!" But... there wasn't actually any text in the book showing that Seth saw her nod.. so it was kind of confusing. I actually had to reread that paragraph like 3 times to figure out what she had discovered because it wasn't very clear.Ultimately, I think Transparent's only downfall is the lack of world building. 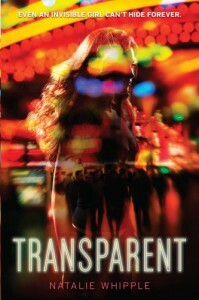 Because I interpreted Transparent as more of a contemporary book, it didn't really bother me. But if you go into it expecting loads of information about the powers, how the world works with them, and what the new society rules are, then you might be disappointed. We do get a bit of background information on how the powers came about, but ultimately the book wasn't exactly overflowing with world building.